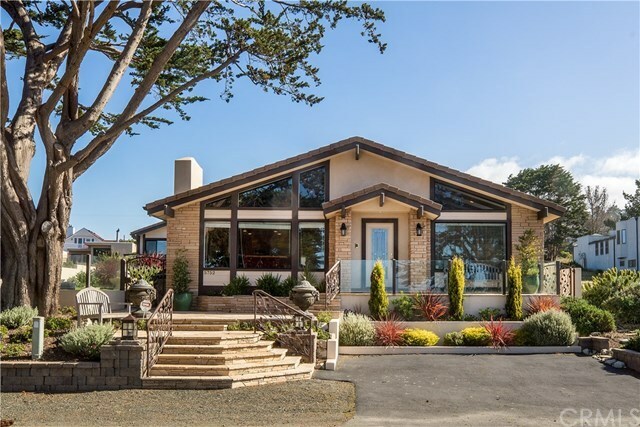 Don’t miss this opportunity to own a classic Cambria beach home located on spectacular Moonstone Beach Drive, across from the Pacific Ocean and the Santa Rosa Creek Estuary. This home has breathtaking unobstructed ocean and beach views and enjoys beautiful California sunsets. This rare, hard to find, single level home with such special coastline views offers an oversized parcel with wonderful outdoor spaces and a rear 4 car garage (tandem). The home features three spacious bedrooms, three baths, a living room and family room, each with fireplace and panoramic views, a granite counter kitchen with stainless appliances, beautiful custom wood built-ins, open beam ceilings, stone and wood. The oversized parcel, with a Gracey designed landscape and hardscape (one of his finest examples) offers an outdoor room with a fire pit, patio, no-care turf and custom ironwork gating. The detached 4-car garage has an attached work area with a 4th bathroom and was plumbed and constructed for a future 500 square foot guest apartment with ocean views. The home has a security system so call your Realtor today to schedule a showing of this magnificent home that is just a few steps from the beach.